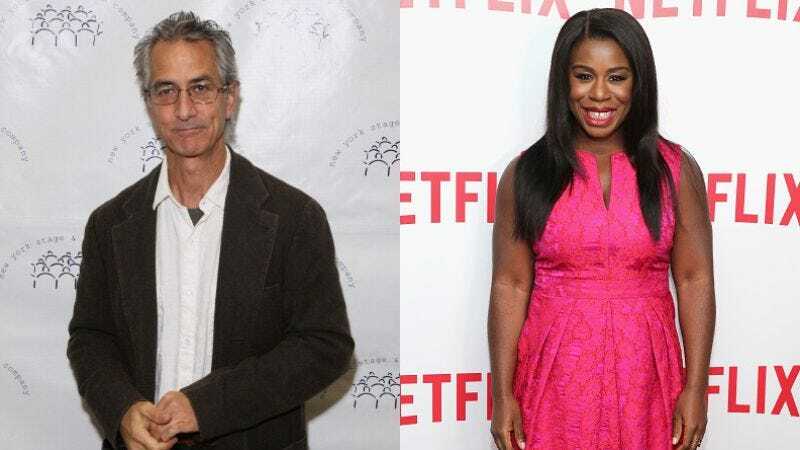 Alphas alum David Strathairn and Orange Is The New Black’s Uzo Aduba will soon be on the most pleasant movie set ever—ComingSoon reports the two have signed on to Ewan McGregor’s American Pastoral. The film has been adapted from the eponymous Philip Roth novel with a script from John Romano (The Lincoln Lawyer), and will be McGregor’s directorial debut. Tom Rosenberg and Gary Lucchesi, who also worked on The Lincoln Lawyer, are set to produce. American Pastoral is set in the turbulent ’60s and follows Seymour “Swede” Levov (McGregor), “a legendary high school athlete” who married a former beauty queen (Jennifer Connelly) and now runs the family business. Their idyllic life is shattered when their rebellious teenage daughter (Elle Fanning) commits an act of “political terrorism” to protest the Vietnam War. Strathairn will play family friend Nathan Zuckerman, a recurring Roth character who served as the book’s narrator. Nothing is really known about Aduba’s character, Vicky, but she may be a new character created for the film. Strathairn recently wrapped a guest stint on The Blacklist and will soon be seen alongside Jesse Eisenberg and Gabriel Byrne in Louder Than Bombs. And Aduba, who’s picked up an Emmy for her work on OITNB, just joined the cast of The Wiz Live! as Glinda The Good.